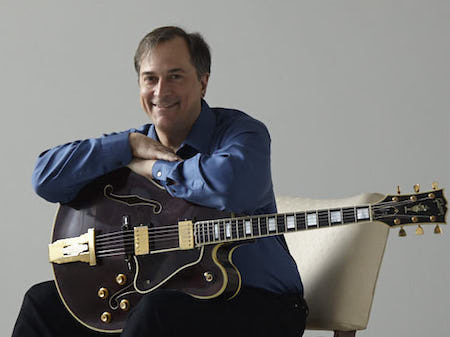 Welcome to the “official” website of Larry Corban, NYC-based guitarist / composer / producer / educator. Feel free to browse through all topics of interest. For bookings, lessons, workshops, sessions, shows, or to just say “hi,” please contact me at larry@larrycorban.com. Enjoy! 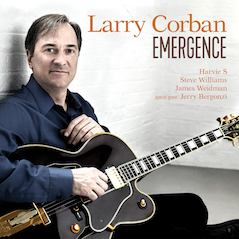 Larry Corban “Emergence” is coming out April 26, 2019! On his fifth recording as a leader and third with the Aperturistic Trio (pianist James Weidman, bassist Harvie S, drummer Steve Williams), New York guitarist Larry Corban wields his burgundy Gibson L-5 with a blend of unabashed swing on uptempo burners and tender lyricism on relaxed ballads. This time out the core quartet is augmented by tenor sax titan Jerry Bergonzi, who elevates the proceedings with ferocious blowing on four tunes. While listening to Emergence, keen ears might detect traces of Corban’s key influences — Pat Martino’s precision picking and driving lines, Larry Coryell’s audacious fusillades, Barney Kessel’s signature sweeping on solos. But Corban’s own voice rings out loud and clear in his rhythmic assuredness and daredevil solos on six fresh-sounding originals and two well-chosen covers here. Looking for a PDF resume or bio, some high-res photos or some downloadable MP3's of Larry's music? Look no further. You'll find everything you need on the EPK page. Check out some new written pieces on improvising, living life as a musician, composition techniques, and a whole lot more on Larry's new blog.